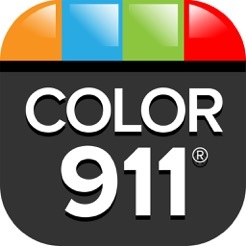 Color 911®: For all your color needs, color help at your fingertips! Color 911® makes color selection fun and easy. Color 911® helps you create your own colors, select colors from themes or photos, combine colors to create your own palettes, organize colors into folders, share or email to designers, friends or family, and so much more! Color 911® features more than 100 downloadable color themes. Each theme has 36 different colors; every theme includes colors that work together for whatever your color needs are. Color 911® is color help at your fingertips! Color 911® delivers instant color inspiration from color specialist Amy Wax, award winning Color Consultant and recognized author of books specializing in color. FINDING YOUR COLORS is easy – Whether you use designer color themes, create your own color on the color wheel, select colors from an Internet or web photo or choose colors from a snapshot or from a photo in your photo library. BRILLIANTLY designed, as the choice of colors is endless. This app is built for the iPads new Retina resolution and is available for the iPhone, iPad and iPod touch. EDIT your colors on your palettes to adjust hue, saturation or brightness. You can reorder your color selection, change color themes, lock in a color, duplicate a palette, with name modification and select colors from a photo. BUILD your personal palette library and create folders using the palette preview tool, which makes organization easy. Color 911® lets you create personal color palettes and share them anywhere, anytime. TAKE NOTES to record your ideas and attach to any palette or folder. This is as easy as writing notes in a journal. ORGANIZE your own palettes in multiple folders with or without your notes. Color 911® makes it easy to arrange your personal palettes for current or future projects. SHARE your colors instantly with family and friends, your designer or your clients! Send your colors via email or share them on Twitter, Facebook and Instagram. COLOR 911® is an essential tool for everyone who works with color, from professional designers, decorators, homeowners, DIYers to color enthusiasts everywhere. This app offers additional themes with future updates & specialized color themes for in app purchases. Amy Wax is a professional color consultant who has written two best-selling books on color. She has aided in the development of color schemes for major companies and has received many notable awards for her expertise in the use and application of color. Amy also served as the President of the International Association of Color Consultants of North America. Amy Wax has been advising happy clients on color selection for years. As an artist, designer and art director, color is her passion. Her experience in the world of color is renowned. This app allows users to create palettes using the Color 911® color themes, or to explore the world of color by creating their own unique palettes. 2-Bug fixes and performance improvements. Interesting concept but the interface is non-intuitive and annoying to use. You have to double tap or triple tap on colors to do different things to them for example. This is a very simple program that could easily have had an intuitive interface. All it does is it lets you select colors from a photo and display them in little squares. Not a good value considering how annoying it is to use. As a web designer I use this app to find color inspiration for site design. I'm able to take the color hex codes from the swatches with ease and use in photoshop. I would think interior designers would love this app too. I use this app every day, whether I am mixing colors to create a color palette to work with, or sharing colors with clients. I also find the pre-made color themes so inspiring. Easy to use, I highly recommend it. © Your Color Source Studios, Inc.